Virus Bulletin, a leading publication on computer security, is organizing this week’s 21st annual Virus Bulletin International Conference in Barcelona, Spain. 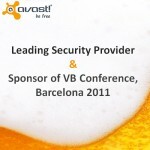 And AVAST is a proud platinum sponsor. So if you are in Barcelona these days and you have couple of minutes to spare, visit the Hesperia Tower Hotel where the event is held. You will get a chance to meet many of the security enthusiasts who have dedicated their lives to fighting viruses and malware. During the next three days, participants will have the opportunity to see about 50 presentations focusing the latest computer security issues. And since this three-day agenda is quite intensive, we decided that the best way to support this event is to be the refreshments sponsor. Any official conference participants can visit the hotel bar from 10am in the morning up through midnight and be served for free. Free is good. And when it is properly cooled, it is even better. Judging from the loud and hearty applause from the audience when our sponsorship details were announced, the conference participants agree!